Like other digital technologies, LED lighting has benefited from the effect of Moore’s Law (referred to by lighting professionals as Haitz’s Law, after Dr. Roland Haitz of Agilent Technologies, when applied to LED), doubling in luminosity and dropping in price at regular intervals to the point where LEDs nearly rival conventional incandescent and discharge-type lighting systems. They’re also becoming more flexible in their ability to render color and incrementally dim. 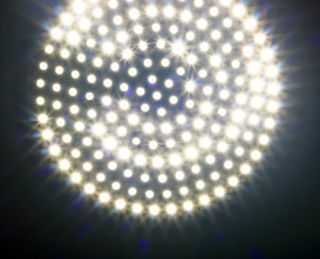 Although LED has vastly improved on the color-wash front, its ability to match discharge, tungsten and other types of lighting technologies for producing white light still lags. However, there are signs that both LED’s underlying technologies and the dynamics of its manufacturing base are moving it forward at a faster clip. February saw the 13th annual Strategies in Light Show, held in Santa Clara, Calif., the heart of Silicon Valley. While economic sentiment at the show reflected the fact that the LED industry had built out faster than the market could absorb new products (China, in particular, has vastly accelerated production of basic LED fixtures and, in the process, lowered the price floor), practical innovation seemed to be moving forward nonetheless. On the manufacturing side, leading makers of conventional light fixtures are bringing their economies of scale into the LED market, with moves such as the acquisition of LED developer Selador by lighting giant ETC in 2009, and Royal Philips purchase of Color Kinetics in 2007. In the pro AV space, Barco’s 2010 acquisition of lighting manufacturer High End Systems and similar moves indicates that LED is ready for its close-up. Still, uptake of LED technology has varied according to event sector. For instance, the concert touring business seems to have embraced LED. Chris Lisle, who runs his own lighting design company from Nashville, Tenn., says he tries to use LED in some way on all of his tours and projects, attracted by the technology’s affordability, durability and capability, as well as its environmental friendliness.